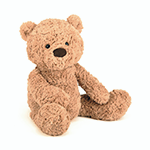 Jellycat Bumbly Bear is simply scrummy, a sandy, dandy teddy. A ruffly, fluffy fellow with an extra-long snout for vintage style, Jellycat Bumbly Bear is a classic bear with a modern twist. His large head and tummy and chunky feet make him just the chap for bedtime hugs. With those tufty ears and that chocolate-drop nose, he's a bear necessity! Paired with Jellycats "Where's My Teddy" book (Sold Separately) will make a great Birthday, Baby Shower, or "Just Because" gift.